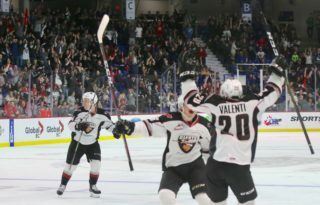 Tonight at the LEC the Vancouver Giants wrap up the unofficial first half of their season when they take the ice at home against the visiting Prince George Cougars. It’s been a tough weekend so far for the G-Men who have dropped two straight games to both Everett and Victoria respectively. Despite the recent skid the Giants are still 7-3 in their last 10. Meanwhile the Prince George Cougars have dropped four in a row and are 2-8 in their last 10 games. For both teams this will mark their final game before a break for the holidays. Originally selected ninth overall by the Cougars in the 2016 WHL Bantam Draft, Calgary, AB native Taylor Gauthier is enjoying his second full season in the WHL. In 24 appearances Gauthier has put together a record of 7-12-1-1 with one shutout, a 3.46 goals-against-average and an .892 save percentage. 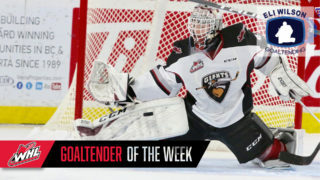 Earlier this week Gauthier was one of two WHL goaltenders named to the 2019 Sherwin-Williams CHL/NHL Top Prospects Game. In two appearances so far this season against Vancouver, Gauthier is 0-2 with a 2.55 goals-against-average and a .907 save percentage. Gauthier suited up for Canada alongside Bowen Byram at the 2018 Hlinka Gretzky Cup in Alberta and backstopped Canada to a gold medal. Gauthier picked up the win in the gold medal clinching game. Gauthier was ranked as a ‘B’ prospect by NHL Central Scouting for the upcoming NHL Draft. 1999-born Belarusian Vladislav Mikhalchuk comes into tonight’s game leading all Prince George Cougars in goals (12) and points (26). Earlier this week on Tuesday, Mikhalchuk notched his first career WHL hat-trick in a 6-5 loss in Seattle against the Thunderbirds. Last season in 60 games Mikhalchuk secured 14 goals along with 19 assists for 33 points. He’s well on his way to obliterating those totals in 2018-19. Three of the four meetings between these two teams have been determined by a single goal. Back in November the Giants earned a 2-1 victory against the Cougars on Saturday, November 10th before falling 1-0 an afternoon later on November 11th. Back on October 6th in Prince George the Giants defeated the Cougars 3-2. Last Game: A 4-2 loss in Victoria. 1999-born forward Owen Hardy is playing some of his best hockey for the Vancouver Giants. The Nanaimo, B.C. product has scored in back-to-back games this weekend for the Giants and comes into tonight’s game with seven goals and six assists for 13 points through 31 games. Hardy also brings a plus-minus rating of +8 to the table along with 32 penalty minutes. Hardy along with Jared Dmytriw and Dawson Holt have played a majority of the season alongside each other, and have all contributed major two-way minutes for the Giants so far in 2018-19. 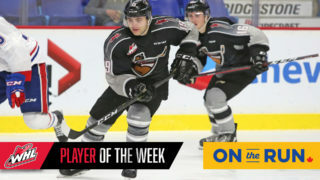 Hardy was originally selected by the Giants in the second round of the 2014 WHL Bantam Draft and is nearing 200 career games played in a Giants uniform. Through 197 career games with the G-Men, Hardy has registered 28 goals and 31 assists for 59 points. Owen Hardy does have one goal this season against Prince George. Through 31 games this season, a glaring strength for the Giants has been their ability to bounce back after a loss or two. The Giants haven’t lost more than two games in a row all season. A win tonight would keep that streak alive. 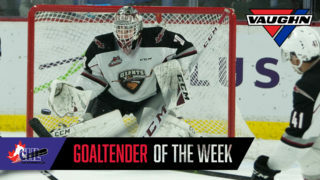 Assuming Trent Miner gets the start tonight for the Giants it could mark another showdown between Trent Miner and Taylor Gauthier – The first two goaltenders selected in the 2016 WHL Bantam Draft. That season Gauthier went ninth overall to the Cougars while Miner went 20th overall to the Giants. In two meetings against the Cougars this season, Miner is 2-0 with a 1.50 goals-against-average and a .956 save percentage.